In the past, I’ve used this Chicken Enchilada Soup recipe. I really liked it, but felt it was a little lacking. So, I looked around at a few recipes, and added in black beans and corn, then used diced tomatoes and green chiles in place of the enchilada sauce. If you want a little more kick to your soup, add in a diced jalapeno with the onion and garlic. It turned out so good! 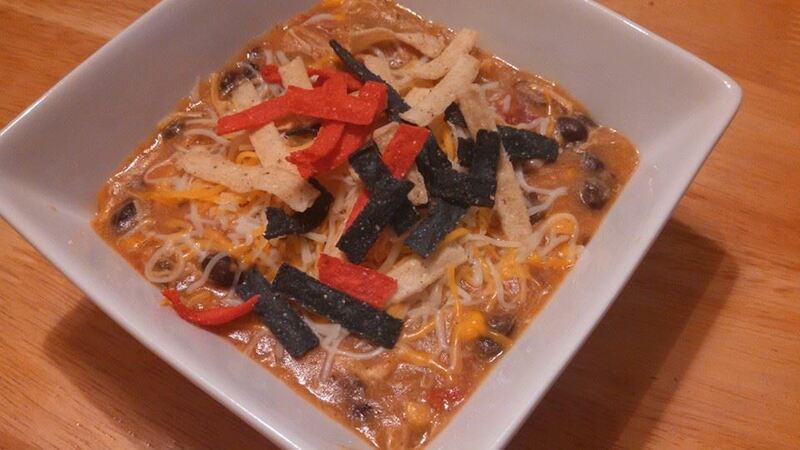 I topped each bowl with shredded Mexican blend cheese and tortilla chip strips. You could also put sour cream, fresh cilantro, and/or a lime wedge. Cook onion and garlic together in remaining oil until onions are translucent. In a bowl, whisk together masa harina and 2 cups water until well blended. This step is important, if you just put the masa harina right in the pot, it won’t blend in as well, making it gritty. Pour into pot along with the remaining 4 cups chicken broth, black beans, corn, Ro-Tel, chili powder, cumin, oregano, and salt. Bring to a boil. Add chicken. Reduce heat to low and simmer 30-40 minutes, until thickened. Katie has been asking me to make chili for the longest time, but I kept putting it off. It’s still warm here in AZ, and hot meals just don’t always sound appealing. But, I have never made it before, so it was time. I know there are a ton of different ways to make it, all based on personal preference. So, we found 5 different versions in the cookbooks that we have, and came up with a combination of our own. It was really, really good! Now, I won’t wait so long the next time she asks. In a large pot, brown the ground beef. Add garlic, onion, green pepper, celery, carrot, and jalapeno, and continue to cook until vegetables have softened. Next, add kidney beans (undrained), diced tomatoes (undrained), tomatoes and green chiles (undrained), tomato sauce, and beef broth. Stir well, adding more beef broth or water if it seems too thick. Next, stir in chili powder, cumin, oregano, lime juice, and salt and ground black pepper. Bring to a boil, then reduce heat to low. Cover and simmer about 20-25 minutes. Last fall, on my trip to Willcox, one of the stops was the Bonita Bean Company. I have been using the pinto beans I purchased to make Refried Beans, but I also had gotten a 9 bean mix I still needed to use. It is a 20 ounce bag containing pinto, cranberry, light red kidney, yellow, black, small red, pink, navy, and Great Northern. I had a pork tenderloin in the freezer to use, along with some green chile and onion, and decided that all would make a good soup. And, with beans taking so long to cook, I decided the slow cooker was the way to go to make this. My older daughter and I thought it turned out really well, in fact, we both had a second helping! Even though I have it labeled as spicy, it’s a low level of heat, but still a little on the spicy side. If you don’t have a bean mix, you can make a mix of your own, a great way to use up small amounts of different kinds of beans! 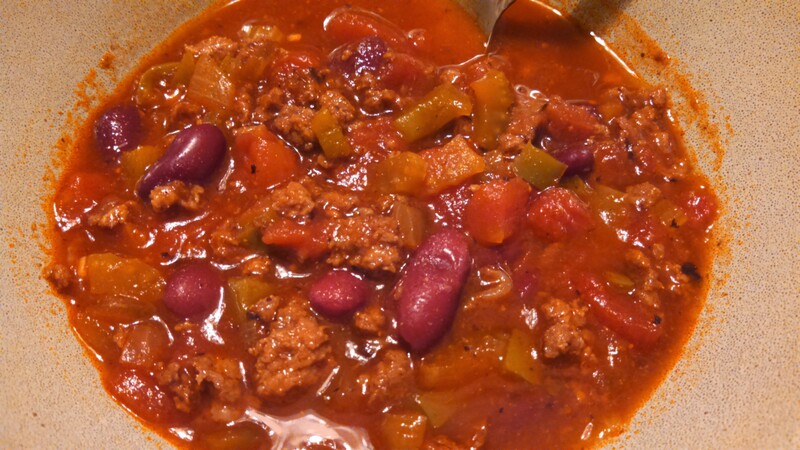 Put beans in a 5 or 6 quart slow cooker. Add pork next, then the remaining ingredients. Cook on high for 5-7 hours, or until beans are tender. I had gotten these before in another Mexican themed pack a while back, but this pack only had one. 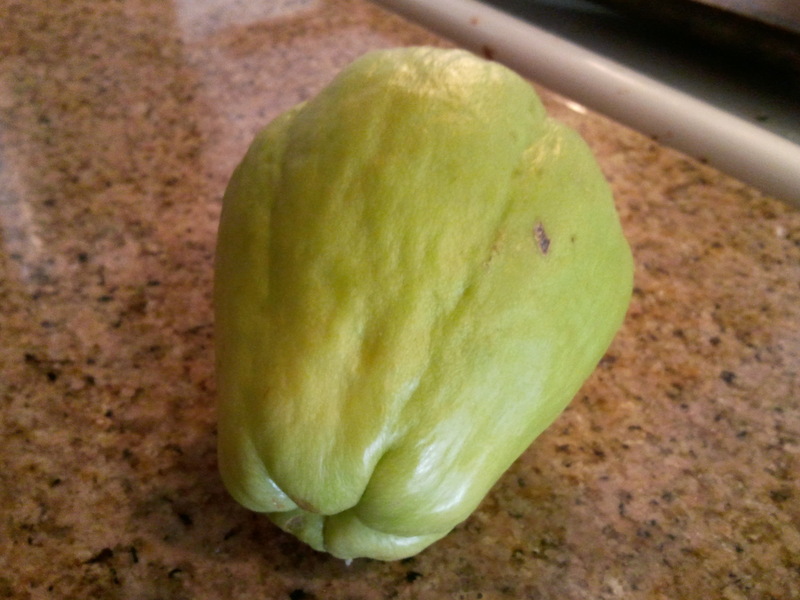 However, there was zucchini as well, and since chayote is also a member of the gourd family, they both go well in this stew. Normally, I would put tomatoes in as well, but my husband requested no tomatoes, so I left them out. This is also similar to the Sausage, Zucchini, and Tomatoes over Rice, but adds a few more ingredients. I would also suggest serving this over Cilantro Lime Rice, which I didn’t get a chance to make because we had to get to a meeting this week. Place a large pot over medium-high heat. 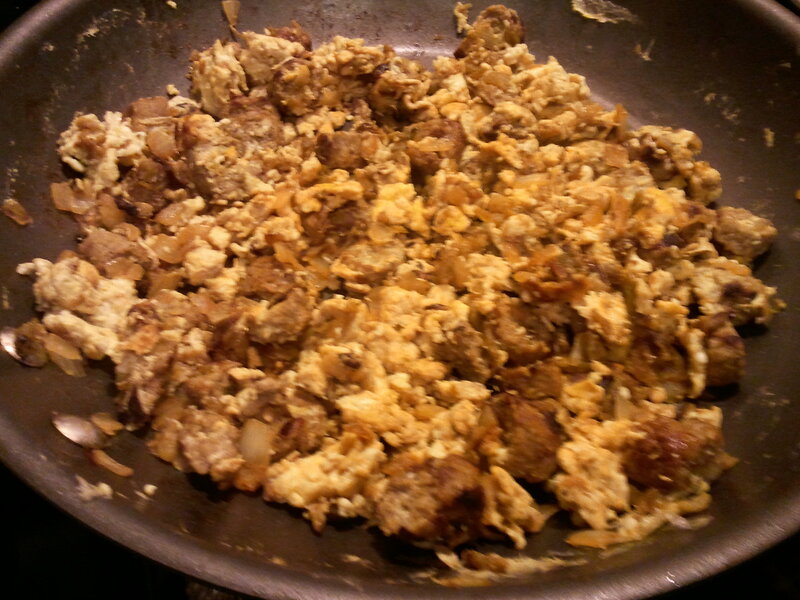 Remove casings from sausage, crumble, and cook in the skillet until browned. Add the onion and garlic to the skillet. Cook and stir until the onions are translucent, 3 to 5 minutes. 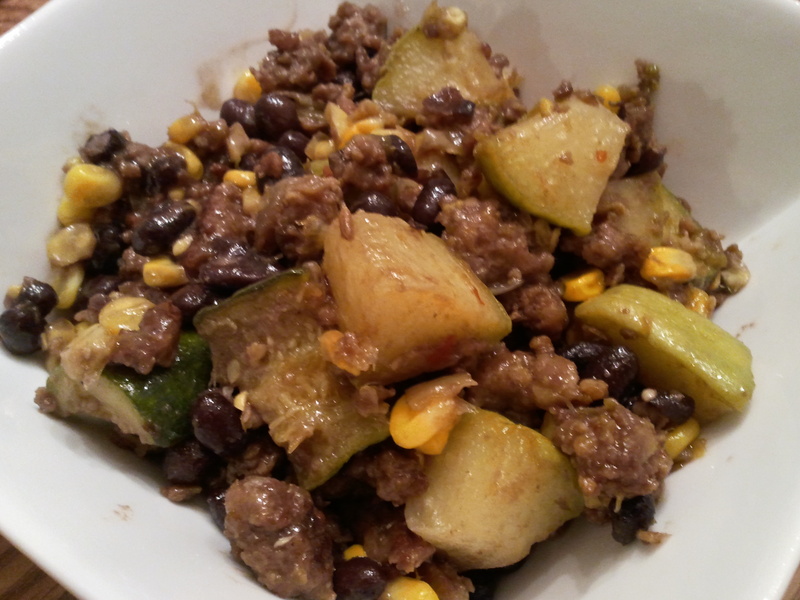 Add the chayote squash and green chiles. Cook and stir until the squash begins to soften, 10 to 15 minutes. Stir in the tomatoes, black beans, and corn. Season with salt and pepper to taste. Cook until completely heated through, about 10 minutes more. Remove from heat and serve over rice. This week, I got the conventional basket, and 2 extra buy add-ons, 25 lbs of Hatch green chiles and the fajita veggie pack. 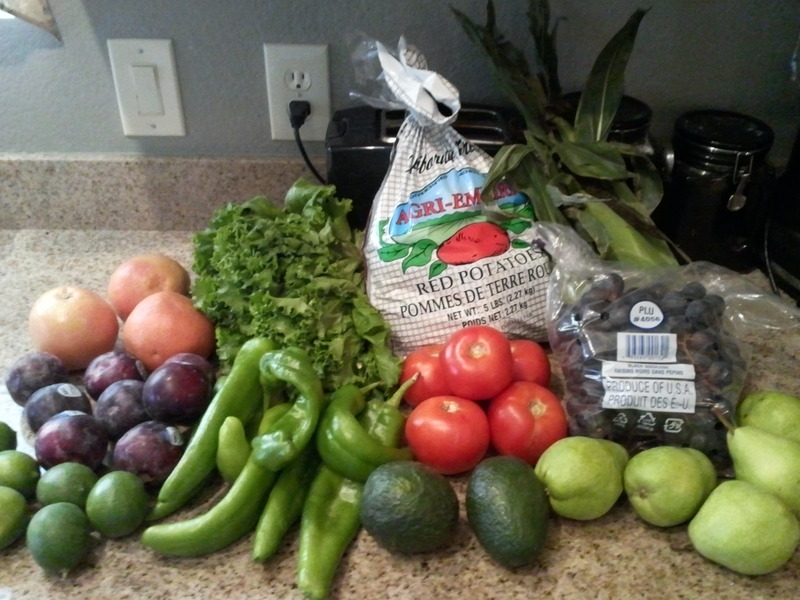 This week’s conventional basket had grapefruit, plums, limes, green leaf lettuce, Hatch green chiles, red potatoes, tomatoes, avocados, sweet corn, black seedless grapes, and Bartlett pears. Lots of green things this week! I was so excited that they offered Hatch green chiles as an extra again this year! The box was about 25 pounds, and cost $18! What a steal! I have 2 friends that each took 5 pounds, and may be sharing more, but I’m happy with even just 5 pounds. They look great and smell wonderful, and are just a bit spicy. Perfect! 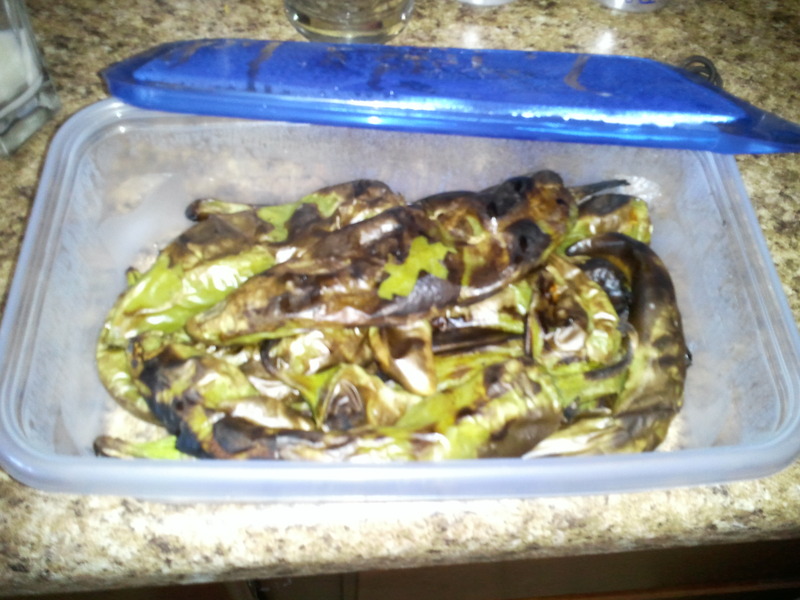 The chiles I kept I roasted on the grill, peeled, and then froze, like I did last year. Only change is that last year I diced them, this year, I left them whole in the freezer bags, just because I didn’t want to take the time with dicing them since I had so many to process. It contained yellow onion, green bell peppers, red bell peppers, garlic, dried chipotle peppers, and dried red chili peppers. Not sure if I’ll do fajitas or not, but excited about trying something new! Note: The type and amount of food may vary from another basket because of geographic location and because of variances in how case ends are distributed once everything is distributed evenly. I also volunteered and got an extra item for volunteering. With the guacamole pack I contributed for a couple of weeks ago, there were some green chiles. 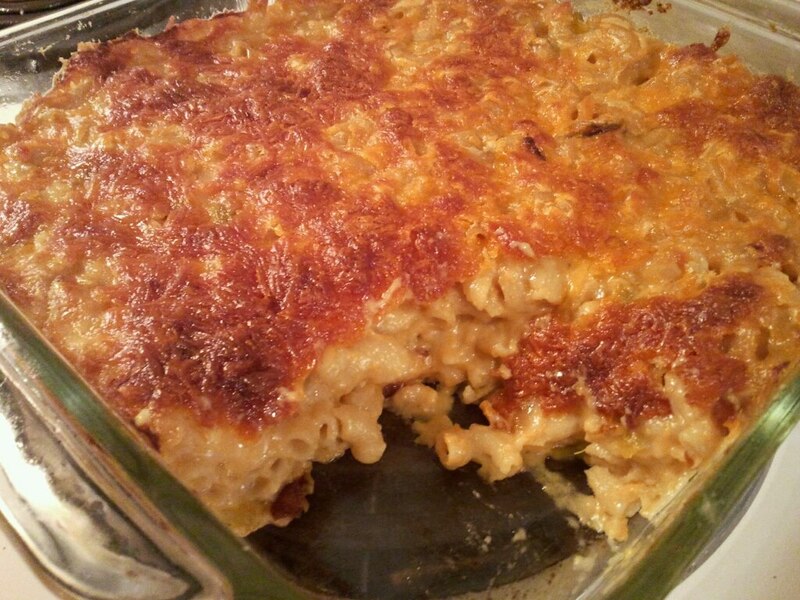 I had been craving some macaroni and cheese, and thought it would be great to add green chiles as I had before. My older daughter loved this, as did my husband and I. It’s spicy, but not overly spicy. Bring a large pot of salted water to a boil. Cook macaroni until al dente, about 8 minutes, or as the box directs. Drain; rinse under cold water. Melt butter in a large skillet over medium-low heat. Add onion and sauté until soft, about 10 minutes. Sprinkle in the flour and cook, stirring constantly, 3 minutes. Slowly whisk in milk. Raise heat to medium and slowly bring to a simmer, stirring constantly. Cook for 2 minutes. Stir in green chiles. Add 1 1/2 cups of the cheddar cheese to skillet, stirring, until all cheese has melted. Season with salt and pepper. Add cooked pasta to the skillet; stir. Spray an 8-by-8-inch baking dish with cooking spray and pour in pasta mixture. In a small bowl, combine corn chips with remaining 1/2 cup cheddar cheese; sprinkle over pasta. Bake in the preheated oven for 40 to 45 minutes, until pasta mixture is bubbling and top is golden. Let sit for 5 minutes, then serve. 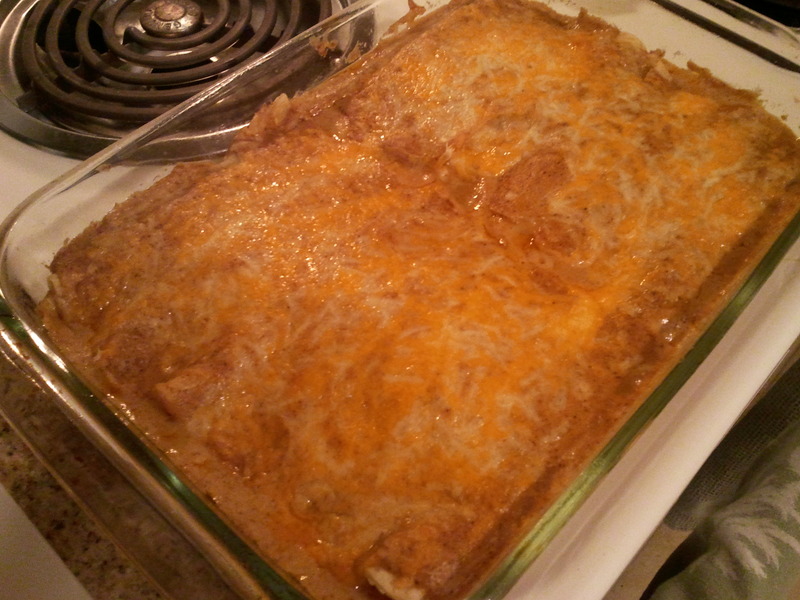 This is my go-to enchilada recipe. I love that the sauce is made from scratch, not from a jar or a can. If you don’t want to make the sauce, you could use a jar or can of sauce, but I really like the way this is made. It’s a creamy red sauce, and it’s delicious. This was also a nice way to use up some of the Hatch green chiles I had in the freezer. Preheat the oven to 350 F. Grease a 9×13 pan. In a medium skillet, melt the 1 Tbsp butter and cook onions until softened. Remove to a bowl. Stir in chicken and green chiles. Meanwhile, melt the 1/4 cup butter. Blend in flour and seasonings, and cook for 3-5 minutes. Whisk in chicken broth and tomato sauce, making sure there are no lumps. Cook, stirring until sauce boils thickens. Remove from heat. Stir in sour cream and ½ cup cheese. Stir ½ cup of the sauce into the chicken mixture. Heat a small skillet over medium low heat. Place a tortilla in skillet and heat on each side for a few seconds to make tortilla easier to roll. Spoon about 2 Tbsp of the chicken and sauce mixture onto one end of the tortilla and roll up. Place in 9×13 pan. Repeat for remaining tortillas. Pour remaining sauce over the rolled tortillas, and sprinkle with the remaining 1 cup of cheese. Bake uncovered for 20-25 minutes. Allow to cool and serve. 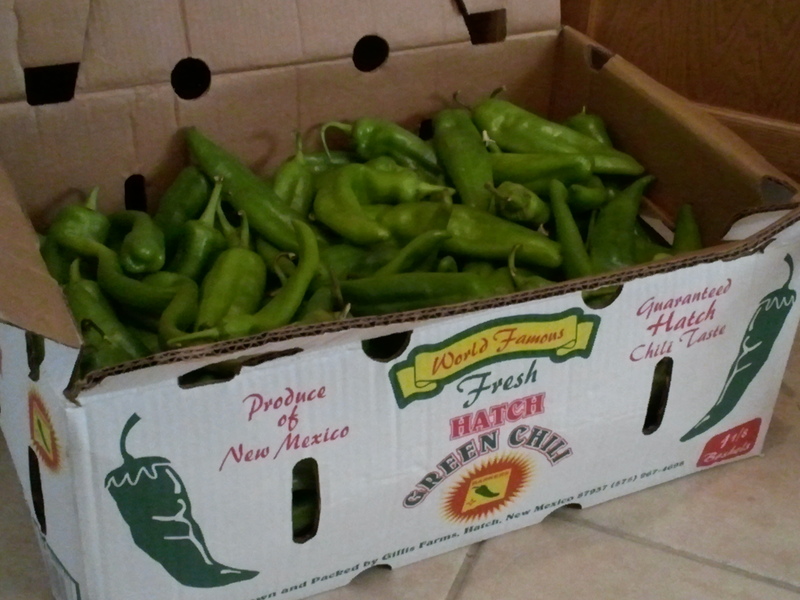 Just before I started this blog, one of the extra offerings for Bountiful Baskets was 30 pounds of Hatch green chiles. 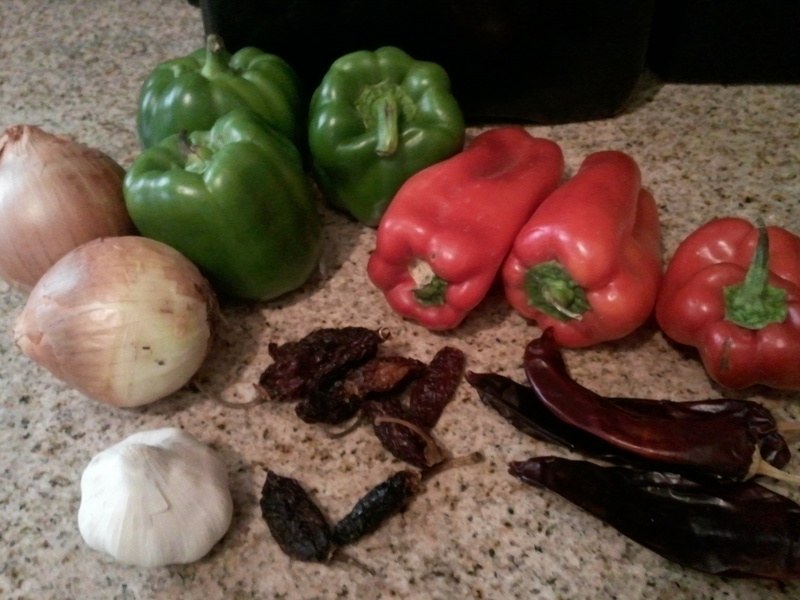 I cooked with some tonight, so I wanted to go back and share the process of preparing the chiles. I did not order them, but a friend did and was looking to share, so I hopped on the opportunity to get some. I don’t use green chiles a lot, but the Hatch green chiles are supposedly some of the best, so I wanted to see what it was all about. First, I had a hard time imagining what 30 pounds of chiles would look like, but apparently they come in a large burlap sack. 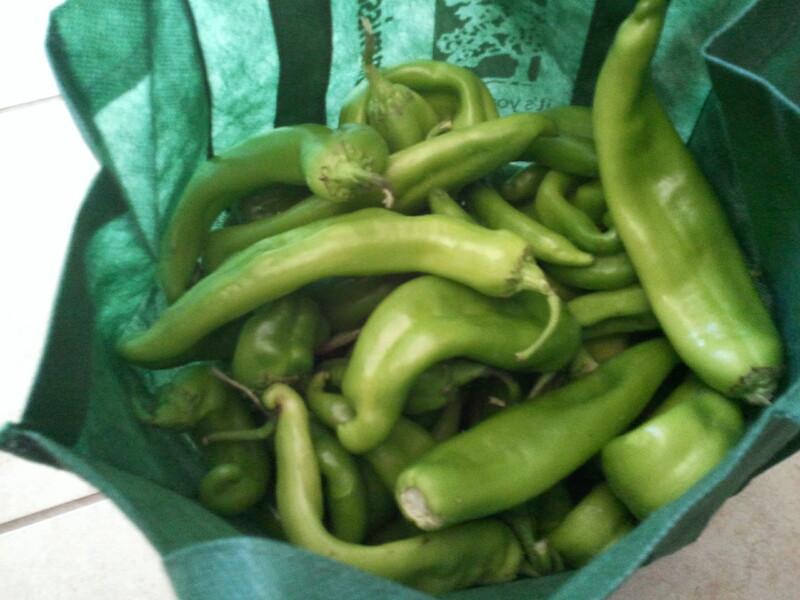 The second that sack was opened, wow, the smell of the chiles was amazing. I got 5 pounds from my friend, as shown in the picture above, plus a few more in my basket that week. Once I got them home, I washed and dried all of them. 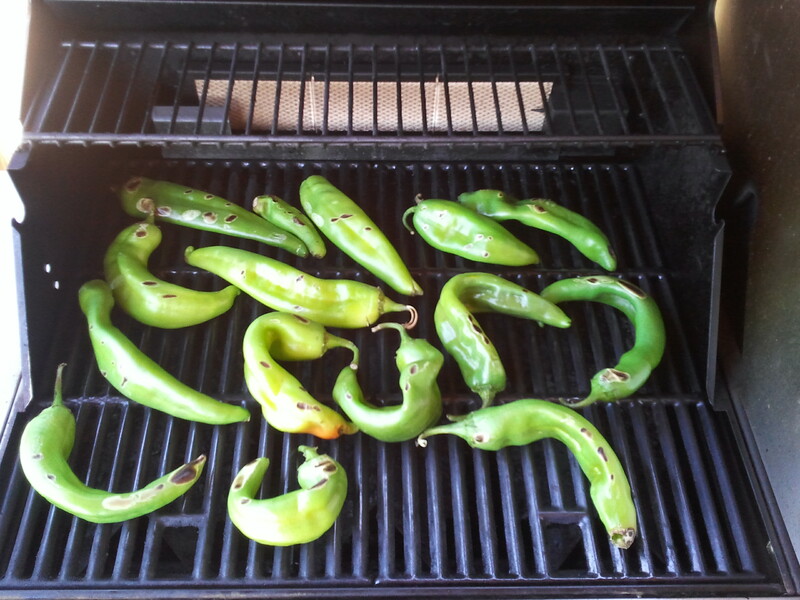 I started up the grill, and put the chiles directly on the grill, in batches. My backyard smelled amazing! You want to grill them, turning every so often, until the skins are mostly blackened. The next step is to put them in a zipper bag or sealed container to let them steam for about 20 minutes. This allows you to be able to get the skin off very easily. Once you remove them from the container, you remove the blackened skin, and hopefully, it will just flake off easily using your hands. (NOTE: When handling you chiles, you may want to wear gloves to protect your skin.) Once the skin is removed, cut off the cap, slit open, and remove the seeds. Dice, the chiles, then divide in containers for later. 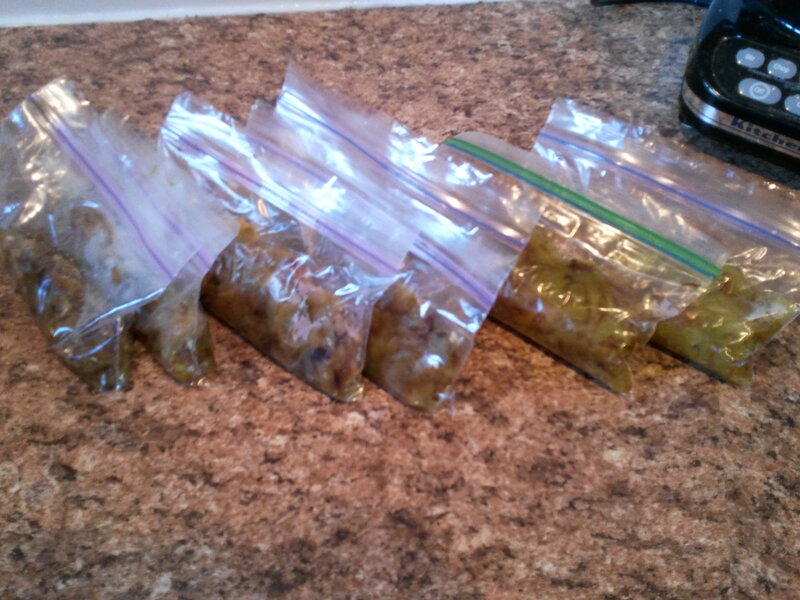 I chose to put 1 cup of diced green chiles into snack size zipper bags. I was able to get 7 1 cup bags of chiles out of the 5 pounds I started with. I made a green chile mac & cheese with one bag, enchiladas with another bag, then put the rest in the freezer. Before I put them in the freezer, I made sure to remove as much air as I could from the bag. Tonight I pulled out one of the bags to make breakfast burritos, that also had onion, turkey breakfast sausage, scrambled eggs, and shredded Mexican blend cheese. I used the large tortillas from Bountiful Baskets, and assembled them like I did for the Steak, Egg, & Potato Burritos. My husband commented that these were the best breakfast burritos I’ve made for him yet, and wanted to know what I did differently. Must have been those wonderful Hatch chiles!